The biceps brachii muscle is the muscle flexed most often to demonstrate one’s strength and dedication to the weight room. In order to get the biceps to grow, it is important to stimulate the muscle using a variety of different exercises and training techniques such as including supersets in your biceps workouts. Supersets are when you perform a set of one exercise and then immediately, without rest, perform a different exercise of the same or different muscle group. Use pre-exhaust supersets in your biceps workout to stimulate muscle growth and improve muscular endurance. A pre-exhaust superset is when you perform an isolation exercise, then immediately perform a compound exercise. Antagonist supersets improve overall muscular endurance and occur by super setting opposite muscle groups such as biceps and triceps. Supersets are an advanced training technique for individuals who have been training at least a year. They help stimulate muscle growth and aid in overcoming plateaus. Change your training program every four to eight weeks will help you continuously achieve results and to prevent injuries. Warmup for three to five minutes with brisk walking or on a cardio machine of your choice. 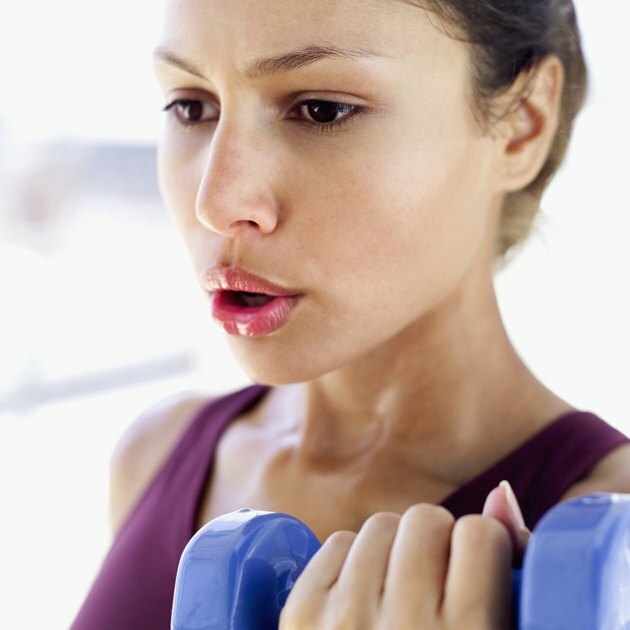 Select a light dumbbell weight and warmup the biceps with 10 to 15 dumbbell curls. Begin by selecting a weight in which muscle fatigue is reached between 10 to 12 repetitions for EZ bar preacher curls. Complete one set of the EZ bar preacher curls, then immediately stand up with the bar and perform a superset with standard barbell curls using the same weight for six to 10 reps. Rest one minute and repeat two to three times. Perform the pre-exhaust supersets with concentration dumbbell curls supersetting with alternating dumbbells curls or with cable curls supersetting with hammer curls. After warming for at least three minutes, perform one warm-up set of 10 to 12 easy repetitions of barbell curls using a light weight. Then complete a warm-up set of 10 repetitions for body weight triceps dips. Rest one minute and increase the weight on your barbell curls, so muscle fatigue is reached between eight and 10 repetitions. Complete three super sets of barbell curls and triceps dips for 15 repetitions. Next, complete three super sets of eight to 12 repetitions for hammer curls and triceps kickbacks. Finish your workout with three supersets of 12 to 15 repetitions of cable curls and triceps rope press downs. The biceps muscles are used often in many back exercises. For this reason, back and biceps are often trained together on the same day. Using supersets in your back and biceps workout helps stimulate muscle growth in both the back and the biceps. Superset exercise order might be as follows pullups/dumbbell curls, bent-over barbell row/barbell curl, seated cable row/cable curl, one-arm dumbbell row/concentration curl. Consider, reversing the order by performing biceps exercises first before your back exercises. Pre-exhausting your biceps forces your back to work harder during the movements, which can help overcome plateaus.